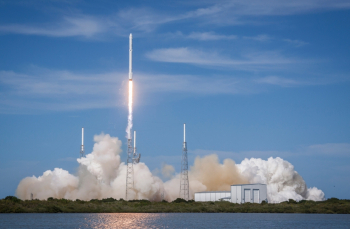 SpaceX conducted its first flight from the US Eastern Range following July’s scheduled maintenance stand down on Monday, with its Falcon 9 resuming operations to deliver a Dragon spacecraft to the International Space Station. The CRS-12 Dragon mission was a “single shot” launch from KSC’s 39A, with the launch taking place at 12:31 (local). Monday’s launch, the eleventh Falcon 9 mission of the year, ended a month-long break in launches from Florida’s space coast. This gap between launches was due in part to planned maintenance that closed the Eastern Range following July’s Falcon 9 mission which carried Intelsat 35e into orbit. The gap was further extended by delays to the launch of NASA’s TDRS-M satellite, which had been scheduled to ride an Atlas V into orbit at the beginning of August. Downtime periods – termed Recapitalization by the US Air Force – are scheduled to allow work to be performed that would be difficult to perform or take longer to complete while the range is operational. They are not uncommon and are typically scheduled around planned launches. SpaceX’s high launch rate in the months leading up to July’s stand down, however, has made the period more apparent. 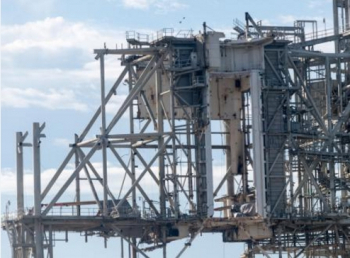 SpaceX has taken advantage of the range downtime to continue with the demolition of the Rotating Service Structure (RSS) at Launch Complex 39A, a launch pad structure designed to support the Space Shuttle and provide access to its payload bay, which is not required for Falcon missions. The Kennedy Space Center’s Launch Complex 39A (LC-39A), which was used for Monday’s launch, was also used by Saturn V rockets during the Apollo era and was the launch site for eight of the nine manned missions to the Moon, including all of the landings. Monday’s launch was the first of three planned for August from the Eastern Range. United Launch Alliance’s Atlas V launch with NASA’s TDRS-M communications satellite has been rescheduled for Friday, following repairs to damage the spacecraft sustained during final processing. At the end of the month, Orbital ATK will launch Cape Canaveral’s first Minotaur rocket – a Minotaur IV/Orion-38 carrying the SensorSat satellite for the Operationally Responsive Space Office. Falcon’s payload is a Dragon spacecraft carrying supplies and equipment for the International Space Station (ISS). The CRS-12 mission is Dragon’s fourteenth flight and is aiming to become the twelfth to deliver cargo to the space station. Dragon was developed by SpaceX under NASA’s Commercial Orbital Resupply Services (COTS) project, making its maiden flight – Dragon C1 – in December 2010. A second demonstration mission, Dragon C2+, was conducted in May 2012 and saw Dragon become the first commercial spacecraft to deliver cargo to the ISS. With the two test flights complete, Dragon was free to begin conducting regular resupply missions under a Commercial Resupply Services (CRS) contract awarded in 2008, for an initial twelve flights. CRS-12 is the last of this original award of missions. However, the contract was amended in 2015 to add further flights, and SpaceX has also been awarded a new contract under the next phase of the CRS program. 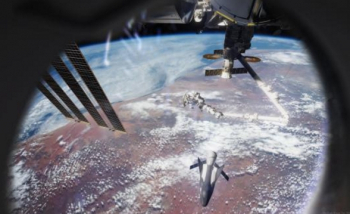 As well as Dragon, NASA also uses Orbital ATK’s Cygnus spacecraft for CRS missions, while Sierra Nevada Corporation’s Dream Chaser Cargo System (DCCS) has been awarded flights under the second phase of CRS, and is expected to fly in 2020. The CRS vehicles form part of a fleet of unmanned ISS support craft that also includes Russia’s Progress spacecraft, Japan’s H-II Transfer Vehicle (HTV, also known as Kounotori) and the now-retired European Automated Transfer Vehicle (ATV). Dragon is the only spacecraft currently flying to the space station, except for the manned Soyuz, which is designed to be recovered at the end of its mission, instead of burning up in the atmosphere on reentry. This allows it to bring cargo and equipment back to Earth from the station, as well as delivering supplies to the outpost. Dragon consists of a pressurized capsule and an unpressurized Trunk section, which houses the spacecraft’s solar arrays and a space for external cargo to be carried. The Trunk is jettisoned when Dragon returns to Earth, and unlike the capsule, it is not designed to be recovered. All of Dragon’s missions to date have been completed successfully, except for CRS-7, which was lost in a launch failure. The Dragon spacecraft is designed to be refurbished and reflown, a capability which was first demonstrated with June’s launch of CRS-11, which used the Dragon C106 capsule that previously flew CRS-4. The CRS-12 mission uses a new-build Dragon, C113. In a recent presentation, NASA ISS Director Sam Scimemi indicated that CRS-12 would be the last CRS flight to use a new Dragon, with subsequent missions all reusing previously-flown capsules. Following Monday’s launch, Dragon will take two days to reach the ISS. Upon arrival, the station’s CanadArm2 arm, under the control of astronaut Jack Fischer, will be used to grapple Dragon and berth it at the nadir, or Earth-facing, port of the station’s Harmony module. 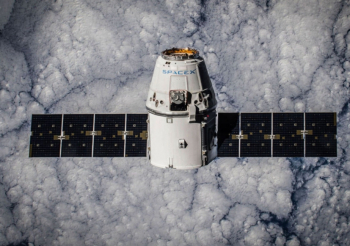 Dragon will remain at the outpost for four weeks, before being unberthed and released. 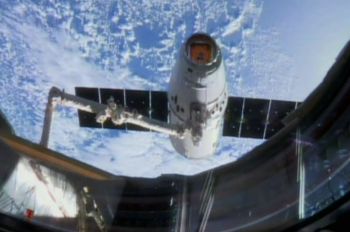 Five and a half hours after its departure from the ISS, Dragon will land under parachutes in the Pacific Ocean off the coast of California. CRS-12 will deliver 2,910 kilograms (6,415 pounds) of cargo to the station. This includes 1,652 kilograms (3,642 lb) of pressurized cargo and the 1,258-kilogram (2,773 lb) ISS Cosmic Ray Energetics and Mass (ISS-CREAM) instrument which is being carried in Dragon’s Trunk. ISS-CREAM, which will be mounted to the Kibo module’s Exposed Facility (JEM-EF) for a three-year investigation, is intended to monitor extremely-high-energy cosmic rays, measuring their charge and energy. ISS-CREAM is an evolution of a payload flown aboard six long-duration balloon missions over the Antarctic between 2004 and 2010. ISS-CREAM will be able to conduct a longer investigation than is possible using a balloon while putting the instrument above most of the atmosphere reduces the proportion of rays that are blocked before reaching its sensors. CREAM uses a transition radiation detector and a tungsten/scintillator sampling calorimeter to measure the energy of cosmic rays, while a suite of instruments – consisting of a Cherenkov detector, a scintillating fiber hodoscope, a silicon charge detector and a timing-charge scintillation detector – will be used to determine their charge. Each instrument provides an independent reading, to ensure the reliability of the data recorded. CREAM will help scientists to answer key questions about the origin of high-energy cosmic rays. This includes characterizing whether all of these rays can be explained by a single source mechanism and validating the theory that supernovae are responsible for the majority of high-energy cosmic rays. The experiment also aims to help explain the “knee” in the spectrum of cosmic ray energies, where the number of particles detected at higher energies drops away faster than models predict above one petaelectronvolt (PeV). Scientific equipment accounts for 916 kilograms (2,019 lb) of Dragon’s pressurized cargo. Experiments include CASIS-PCG 7, which will grow an enzyme – leucine-rich repeat kinase 2 (LPRK) – in microgravity. The crystals of this enzyme, which can be grown to a larger size and a more perfect shape in space, can be studied to increase understanding of this enzyme, which is linked with Parkinson’s disease. Another experiment will grow lung tissue to determine how microgravity affects its development and determine whether this technique can be used to produce tissue samples for future biological, medical and pharmaceutical research. New seed pillows for the space station’s Veggie plant growth system and twenty mice for the Rodent Research 9 experiment will also be delivered. Another investigation, being conducted as a partnership between NASA and Hewlett Packard (HP), is the Spaceborne Computer. This will place an off-the-shelf one-teraflop supercomputer aboard the space station for a year to study whether software can be used to compensate for the space environment rather than using specialized hardware. Dragon’s cargo also includes 220 kilograms (485 lb) of provisions for the crew, 339 kilograms (747 lb) of station hardware, 53 kilograms (117 lb) of computer equipment and 30 kilograms (66 lb) of hardware to support spacewalks. 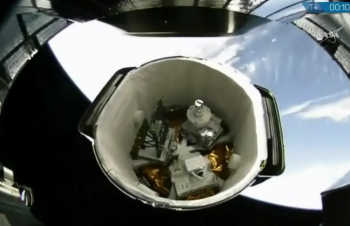 Dragon is also carrying several small satellites to be deployed from the space station. 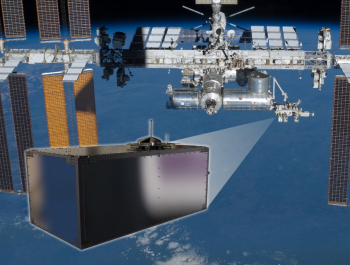 Kestrel Eye 2M – also known as NanoRacks-KE IIM – is a 50-kilogram (110-lb) nanosatellite equipped with a commercial off-the-shelf imaging system. The spacecraft was developed by Maryland Aerospace and is sponsored by NASA and the US Department of Defense. It forms part of the US Army’s Kestrel Eye program, to investigate the use of a fleet of small, medium-resolution spacecraft to provide real-time tactical intelligence to soldiers in the field. This prototype will also be used to investigate possible civilian uses for the satellites, including natural disaster monitoring and meteorology. It will be deployed later this year, to begin a six-month mission. Three CubeSats are being carried for ELaNa XXII, part of NASA’s Educational Launch of Nanosatellites program. The Arcsecond Space Telescope Enabling Research in Astrophysics, ASTERIA, has been developed by the Massachusetts Institute of Technology (MIT) in conjunction with NASA’s Jet Propulsion Laboratory. 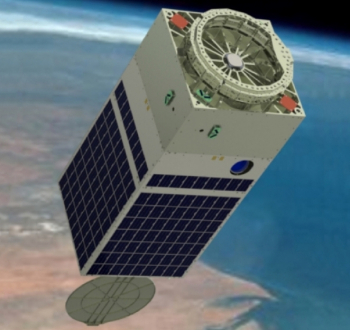 A six-unit CubeSat, ASTERIA carries an imaging payload mounted on a two-axis piezoelectrically-actuated platform. The spacecraft itself is three-axis stabilized using reaction wheels, while the piezoelectrics will provide fine control to point the instrument with precision of within an arcsecond. The satellite will be used for astrophotometry, and as a demonstrator for future missions. Dellingr, another six-unit CubeSat, carries a compact ion/neutral mass spectrometer (INMS) and a pair of magnetometers. The spacecraft, originally named the Radiation Belt Loss Experiment (RBLE), will demonstrate a new CubeSat bus and provide data on the densities of ions and neutral atoms in Earth’s ionosphere. It is intended to complement research being conducted by NASA’s Van Allen Probes. 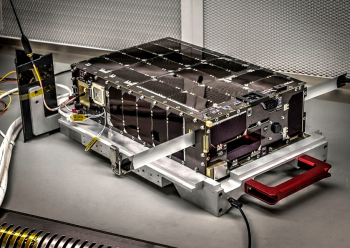 The Orbital Satellite for Investigating the Response of the Ionosphere to Stimulation and Space Weather (OSIRIS-3U), a three-unit CubeSat, will be operated by the Pennsylvania State University. It is equipped with a Langmuir probe and receivers to study the occultation of signals from GPS satellites as they pass through the ionosphere. The mission aims to investigate what happens when radio signals pass through the F-region, or Appleton-Barnett layer, of Earth’s ionosphere. It will also study the interaction of space weather with the ionosphere. The Overview 1A satellite, owned by San Francisco-based SpaceVR, is being carried as a commercial payload. A three-unit CubeSat, it carries a 360-degree camera will be used to offer a live virtual reality experience of space to subscribers. 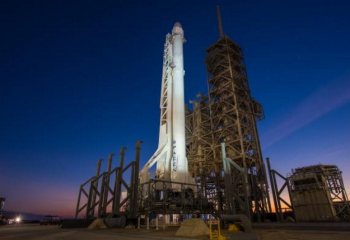 Dragon will ride to orbit aboard SpaceX’s Falcon 9 rocket, which is making its thirty-ninth flight. A two-stage liquid-fuelled rocket, Falcon 9 consumes RP-1 propellant, oxidized by liquid oxygen. It first flew in June 2010, carrying a mockup Dragon spacecraft. Falcon 9 has since launched all of Dragon’s missions, as well as an increasing portfolio of commercial and US government missions. 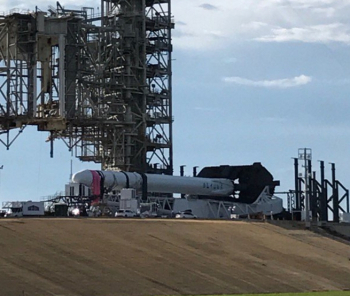 Monday’s launch debuted a new revision to the Falcon 9, which is known unofficially as the Block 4. This upgrade increases the thrust provided by the rocket’s Merlin-1D engines and includes other upgrades ahead of a further revision, Block 5, which is expected to be introduced with Crew Dragon’s Demo-1 mission next year. The Falcon 9 has already evolved since its introduction. The original version was used for the first five launches before the first major upgrade, the Falcon 9 v1.1, first flew in September 2013. This stretched the rocket and rearranged the first stage engines into their current octagonal, or OctaWeb, configuration instead of the square grid that had been used previously. A further revision, the Falcon 9 v1.2 or Falcon 9 Full Thrust, was introduced in December 2015 with uprated engines, a further stretched second stage and colder, denser, oxidizer. Incremental upgrades, such as a faster fuelling process and more resilient titanium grid fins, have been made between flights. Falcon 9’s only launch failure, which involved the penultimate Falcon 9 v1.1, came in June 2015 as the rocket was carrying CRS-7, the ninth Dragon mission, bound for the International Space Station. The vehicle disintegrated late in first stage flight after a second stage helium tank broke loose and the second stage overpressurized. A second Falcon 9 was lost last September, along with Israel’s Amos 6 satellite, when the rocket exploded during fuelling for a pre-launch static fire test. While not a launch failure, in that no launch was being attempted, the explosion saw Falcon grounded until January and caused extensive damage to Cape Canaveral’s Space Launch Complex 40. Complex 40 is still undergoing repairs and is expected to return to service in the next few months, possibly as soon as the SES-11 launch planned for early October. The first stage of the Falcon 9 for Monday’s launch was Core 1039. It was powered by nine Merlin-1D engines, which ignited three seconds before Monday’s countdown reached zero. Falcon lifted off at T-0, beginning an ascent that took her northeast over the Atlantic Ocean. Sixty-eight seconds after liftoff the rocket passed through Max-Q, the area of maximum dynamic pressure. Core 1039 burned for two minutes and twenty-five seconds before main engine cutoff (MECO). Stage separation took place three seconds later, after which the first stage beginning its descent back to Earth and the second stage continuing towards orbit. Second stage ignition occurred eight seconds after staging. The second stage’s single Merlin-1D Vacuum engine made one burn, lasting six minutes and 38 seconds. Dragon separated from the second stage ten minutes and fourteen seconds after liftoff, deploying its solar arrays forty-six seconds later. Falcon 9 is designed to be reusable. Depending on the mass of Falcon’s payload and its target orbit, the first stage can fly back to the launch site, land on a floating platform – the Autonomous Spaceport Drone Ship (ASDS) – downrange, or can be flown expendably without recovery hardware to maximize primary mission performance. Monday’s launch saw a landing at Cape Canaveral’s Landing Zone 1, the former Launch Complex 13. It was the sixth landing attempt on land and the nineteenth overall. Following staging, Core 1039 reoriented itself using cold gas thrusters and performed a boost back burn to put itself on a course back towards Cape Canaveral, beginning thirteen seconds after separating. Four grid fins deployed to help guide the rocket’s descent back through the atmosphere. A second burn was made at around six minutes and nine seconds elapsed time to slow the core as it reentered the atmosphere, with a final single-engine burn igniting shortly before touchdown. 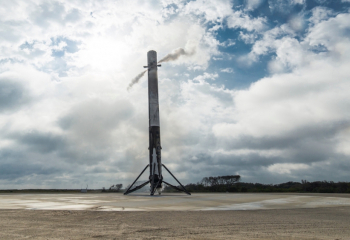 Landing legs deployed from the base of the rocket and B1039 made a controlled landing at around seven minutes, 43 seconds mission elapsed time. Following Monday’s launch, SpaceX will next be in action on 24 August, with a Falcon 9 launch from Vandenberg Air Force Base in California, carrying the Republic of China’s Formosat-5 mission. Falcon’s next East Coast launch is expected around 7 September with the US Air Force’s X-37B spaceplane aboard, while the next Dragon launch is now slated to occur in early December.